After all my decades of hanging out at wine and food events–and I am going back over 30 years now when I first met Julia Child and Bob Mondavi at the first meeting of the American Institute of Wine and Food–I had never met culinary giant, chef extraordinaire, founder of La Varenne cooking school, author of something close to 40 books, and all around amazing woman –Anne Willan. Then, recently, my luck changed. Anne and I were suddenly at the same events, over and over, in the past couple of years. I introduced myself over and over, not because she didn’t remember but because I didn’t EXPECT her to remember. But each time she did remember and each time we had a nice conversation. I liked her more and more until I actually started thinking of her as a friend. I was very happy to see her at each encounter. Isn’t that how you feel about people you call friends? Vinegar mothers last forever and can be pulled apart and pieces given away with no harm to the original mother. In other words, mothers can be shared! What I didn’t know is how personal of a request is that to ask someone to share their mother? Could I ask Anne? Or was that like asking her if I could borrow a pair of underwear? I had no experience when it came to mother etiquette. I knew I would be seeing Anne in DC for the very exciting first annual Smithsonian Food History Weekend so I thought about asking for the mother. But once I saw her, I chickened out. Like I said, I wasn’t sure how that would come across and even though I thought of her as a friend, she may still have me in the acquaintance zone. So I said nothing. But it was on my mind. And when I ended up in a private conversation with her son-in-law, I asked for advice. “Do you think Anne would be willing to share a piece of her vinegar mother with me?” When he said I should ask her, I explained my dilemma. Just how personal a question is that? Would that be offensive? Opportunistic? Did she have lists of people waiting for a piece of her mother? He didn’t know. So I left it at that. It wasn’t more than a couple of hours later that Anne walked over to me at a cocktail reception where I was talking with a friend and said, in her charming English accent, “I understand you would like a piece of my mother?” My friend, with whom I had not shared my mother dilemma, laughed heartily and said, “Now that requires some explanation!” The three of us giggled like little schoolgirls about Anne’s mother and how I wasn’t sure how to go about requesting a piece of her mother. She thought the whole thing was hilarious and told me that of course, I was to come to her home in Santa Monica and collect a piece of her mother. 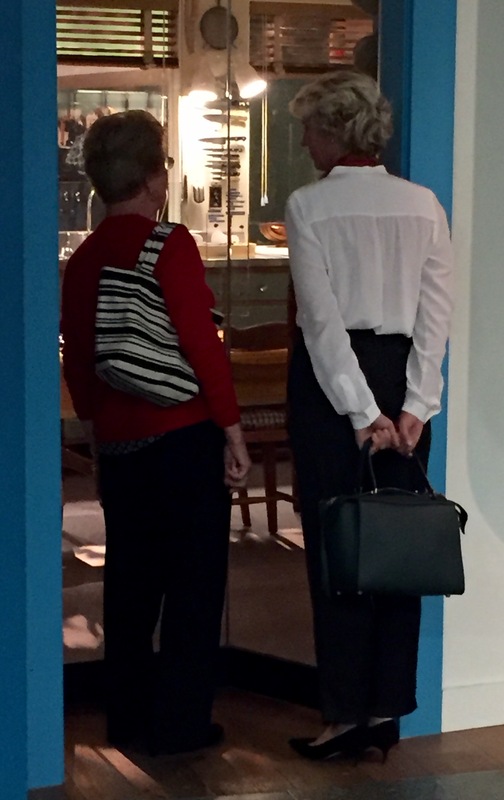 It was then that Anne told me she had never been to see Julia’s Kitchen at the museum. She had been inside the kitchen many times in Julia’s home, but never since it came to the museum in 2002. It was my absolute honor to take her there. She smiled broadly as we peered through the plexiglass and took in the magnitude of it all. It was so familiar, in an unfamiliar place. Anne shared with me her memory of coming in through that very doorway one time with her arms loaded with truffles she had just brought from France. She reminisced about how Julia always put people to work as soon as they arrived and her words to Anne were something to the effect of “Well those truffles will need a good scrub in the sink, won’t they?” Anne’s face was soft with happy recollection as she said quietly, gazing across at the sink inside Julia’s Kitchen, “So I went right over and started scrubbing.” Then she looked at me and smiled. Maybe we really are friends now. Place vinegar mother into a large crock in a cool spot in the kitchen. Add wine to crock. Wait at least 6 weeks and taste to see if vinegar is to your liking. If so, pour the vinegar into bottles, leave the mother in the crock and add more red wine. Keep the process going for up to 50 years or until you give your mother to someone else for safekeeping. So kind of you Denise! Is it too personal to request one of Anne’s grandchildren from you? I’d really love one! Loved reading this and learning along with you as you keep stretching. I saw Jack Bishop speak last evening and he said the 2015 state of the recipe includes one of the following: 1) a formula 2) a cultural icon 3) a family heirloom or 4) a shared experience through friendship. YOU are the consummate of this definition. Very nice. Learn something each time — and I wouldn’t have put “vinegar mother” together in a hundred years. Great post, Cynthia! Have heard about mother yeast, but never mother vinegar! Red, red wine…… Will never look at a half empty bottle without thinking of you and yummy mummy.